Teaching is a wonderful profession. I would even call it the best profession. It is full of challenges and “warts” like any other field, but there is really nothing like it. Regardless of whether we are teaching five-year-old students or fifty-year-old professionals, teaching starts with a lack of knowledge or skill and ends with something gained by the individual that cannot be taken away. Education opens doors, increases opportunity, and makes all of us better, more well-rounded human beings. It is true that not every day in the classroom feels like this. Paperwork, meetings, and state mandates all distract us from the bottom line of kids learning and growing. In recent decades, the quantity of “other things” that teachers have to worry about and do has greatly increased. Can We Afford Quality Teachers? As a result, our profession has taken a hit. More teachers are retiring than are entering the field, and many individuals only teach a few years before going on to other career options. State budgets declined, as did salaries and benefits. Insurance costs increased, and as a result, many teachers with experience had stagnant salaries year after year. We had visible evidence of this in 2018 when teachers in West Virginia, Oklahoma, and Arizona went on strike because of the lack of funding. Whether you agree with the approach or not, it does speak to the state of our profession across the country. As an incoming college student or an old adult considering a career change, it could be tough to look at our profession and want to join. All of these negative factors can add up to a lack of quality people entering the field. Data shows that it has already started to take a toll. Talk It Up: One telltale sign of being in the wrong profession is actively discouraging your own children from considering the field you currently work in. All of us should feel meaning in what we do, and if that is lacking in vital profession like education, something needs to change. If educators were consistently positive about teaching, we wouldn’t have trouble recruiting new teachers. Invite Them In: For some, there is a mystery to what goes on in the classroom. 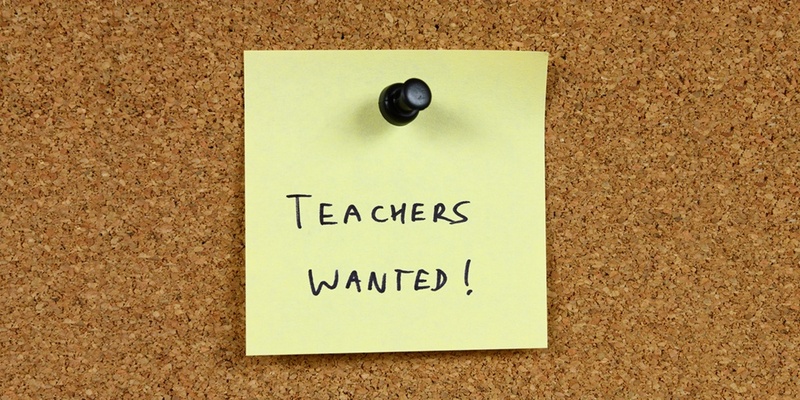 Most remember what it is like to be a student, but what is the “job” of a teacher really like? We need to invite high school students or career changers into our classrooms to see what it's like “behind the scenes.” For some teachers, they love this part of teaching—the planning, the themed units, the bulletin boards, and the novel selection. Seeing this part of the job could be what hooks a future teacher into joining a school. The Why Keeps Us Motivated: If you asked most teachers why they do what they do, they would talk to you about the difference they make in the lives of kids and in the future of our world. If an outsider has never experienced this, it may sound flowery and idealistic, but it is really true. All teachers have stories of students who struggled, students who turned their lives around, students who began to love school, and so on. These are real stories of real situations. Kids need champions in the classroom, and all kids have the potential for a great future. It’s an honor to be part of that, and a highly motivating reason to get up and go to work every morning. Focus on the Positive: Beyond the “why” mentioned above, the job itself is a pretty good one. For example, there is a great deal of stability in the profession. Most schools offer extended breaks of some sort, either during summer or periodically throughout the year if a school is year-round. The profession draws great personalities, so many schools have a fun culture of adults to work with. Every day brings new challenges and opportunities to grow, and some of us love the content areas that we teach. To have the chance to work with the content we love every day is a huge bonus. When “the Light Goes On”: Most teachers would admit the number one reason for loving their profession is when we see “the light go on” in a student’s mind. That feeling of helping someone understand something that they didn’t before—there is nothing like it. This is teaching, and this is what teachers love about our job. Every job has its downside, but I really hope that everyone finds a profession in life that they love, no matter what that may be. If you have never considered teaching as a profession, find a classroom and check it out—I think you will love it! Another great teaching perk? Connecting with fellow educators! Consider joining an interactive teaching community like MimioConnect™ for helpful teaching tips, insightful forums, engaging lesson content, and more.